Its "good tidings" in Alang"
Ship breaking is the end of life for any form of ship which toiled its long years in the high seas with captain, crew & the people around it. Only few places in the world have got right geographical setting and proper infrastructure to put an end to these old ships and one such place which is lined with coastal shores, right tides and the presently developed infrastructure is Alang, at the west coast of Gujarat, India. 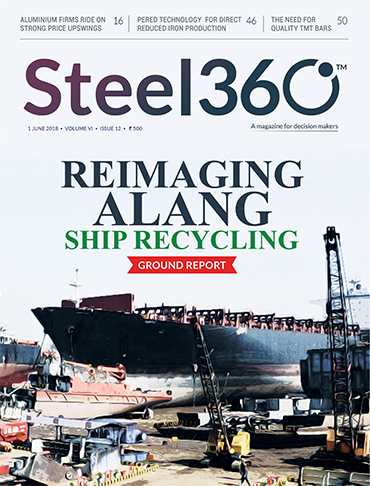 Steel360 visited the ship recycling yards of Alang to know the exact situation and the waves of changes as the green ship recycling is taking over the yards. Alang is witnessing a drastic shift especially towards green ship recycling and it is reimaging its outlook by following all the certification, upgrading infrastructure, safety standards, and being environmentally conscious. Ship recycling in India contributes around 1 to 2% for domestic steel demand and most of dismantled ship scraps are recycled and reused. A case study report on NMDC by our columnist especially on Bailadila Mines is worth a read. Steel technology stories on steel framed football stadium in Russia, how mobile canning tackle global hunger and PERED tech for DRI productions by our columnists gives a wider angle on the use of technology in the steel industry. Special reports on Indonesia & Iran steel industry and articles on quarterly sales growth of Tata & JSW steel & Aluminum companies in India which are witnessing bullish domestic demand even though prices are expected to soften in near term.